When planning the theme of your wedding, you need to have a clear idea of the big picture in your head - and not just about your own bridal gown, the décor and the venue. The bridesmaid dresses also need to be well thought out and considered, and their style must contribute to the coherent flow of the entire event. However, some brides think that choosing the outfits for their entourage doesn't need to be such a big deal - after all, all eyes will be on the bride, right? On the contrary; choosing a theme for the entire party not only adds to the mood of the event, but it also ties all the elements together perfectly. It can also make for a very interesting and memorable photo shoot! Check out the following themes that could work for different wedding motifs. Ombre is a very trendy concept nowadays - but it normally applies to hair colour rather than bridesmaid dresses! However, it's a great way to get creative with your wedding party theme. Don't be afraid to consider a seemingly over-the-top idea like this, because you can always opt to tone it down a little. 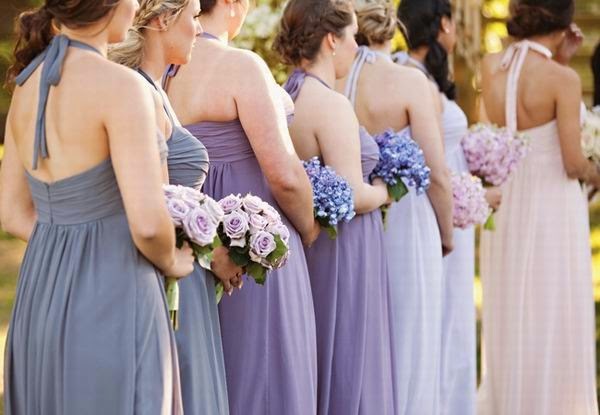 For instance, instead of making your attendants wear a dress with such a striking gradient colour effect, you could opt for each girl to wear a different shade of hue that corresponds to your overall decor instead. Carefully chosen styles in complementary colours will create a lovely, muted ombre effect, especially in photos, and will allow the bride to stand out in flawless and immaculate white. The ombre effect also looks great for the procession down the aisle. But apart from the aesthetic benefit, this kind of theme will also provide you with more options when picking out a colour for the party. Vintage will never go out of style and it's never a bad idea as a wedding theme! 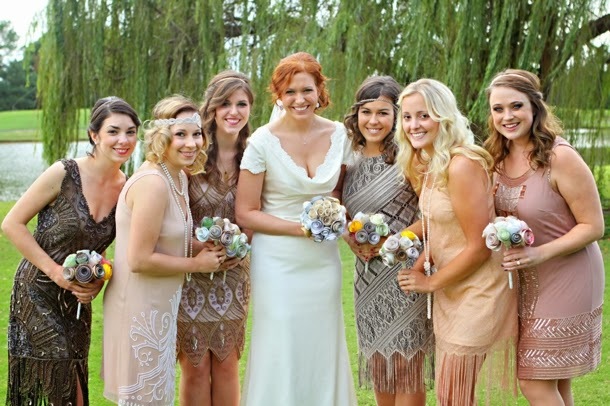 There are multiple benefits to choosing vintage for your bridesmaid dresses. For starters, you can easily scout for authentic vintage finds in thrift shops as a cheaper alternative, and you don't have to worry about everyone wearing the same style as long as they stick to the theme. Furthermore, there is an appeal in having your attendants wear dresses belonging to a specific era; it creates a more relaxed ambience, while still maintaining the coherence of your wedding theme. Another great not quite so vintage theme for bridesmaid dresses is the Rocking 50s. Since vintage themes usually provide you with plenty of options and room for creativity, they will always be a great option for any modern bride. For your bridal gown you could go full-on 50s style, in a retro dress with a tight bodice and a full skirt, pearls for accessories, and satin heels. Meanwhile, your attendants could wear cute dresses with net petticoats for a dainty and elegant look. This style looks particularly amazing for the walk down the aisle. Looking for couture bridal gowns? Tatiana Porembova is one of the leading London designers for bridal gowns and bridesmaid dresses and her work spans a range of styles and influences. Based in Richmond, she creates beautiful bespoke wedding attire to provide the perfect garments for the perfect day.